it became part of Socialist Federal Republic of Yugoslavia. 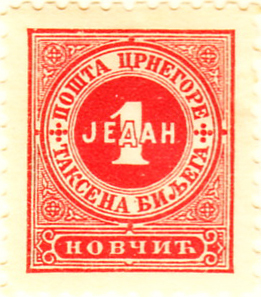 In 1992, Yugoslavia dissolved but Montenegro remained with Serbia in the Federal Republic (the ‘Socialist’ component was dropped) and then as Serbia and Montenegro in 2002 (the 2003 stamp shown, denominated in Euros, was only used in Montenegro). In 2006, Montenegro became independent. Montenegro was occupied by Austria in WW1 And by both Italy and Germany in WW2. 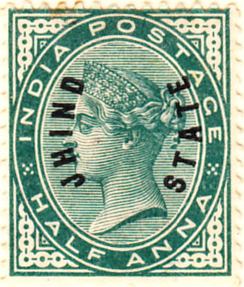 Jind, as did Faridkot, issued stamps as both a Feudatory and a Convention state. The Feudatory period was 1874 to 1885 and the Convention 1885 to 1943. Bhopal and Poonch were both Feudatory states. Bhopal’s is not the #1: it was bought as an SG5; looks like an Sc5 and is representative of the early designs. 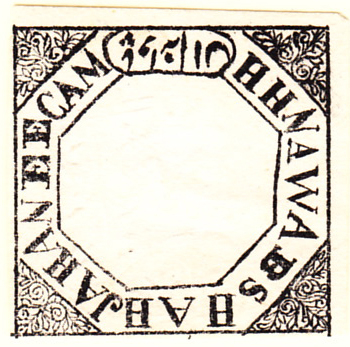 Poonch’s first few stamps are expensive and so a later stamp will be shown: the 1884 SG7 Sc8 looks favourite.